After Memorial Day Weekend at my parents’ camp, I drove home Monday night, dumped the tent and sleeping bags back into the garage, took a shower, packed a suitcase with conference clothes, and set the alarm for 4 a.m. By Tuesday afternoon, I was checking into a dorm on a lovely campus set in the state made famous by the Wizard of Oz — and getting hugged by Friendly Green Folks. The Friendly Green Conference is more than an academic conference: it's a community. Many of my Friendly Green Colleagues are close friends. We’ve read each other’s books, listened to each other’s presentations, and sat together to listen to plenary speakers. We’ve shared many meals and conversations, including lively arguments and impassioned rants. We’ve spent time hiking mountains, and visiting botanical gardens, and white water rafting, and doing yoga, and canoeing on rivers. We’ve cried together, laughed together, and confided in each other. Friendly Green Conferences days are long — starting at about 7 am for yoga and then breakfast — and filled with sessions that are intellectually stimulating. By yesterday evening, most of us were tired, but it seemed frivolous to waste time on sleep when we could be spending time with our friends. So instead, we gathered in a lounge, lugging musical instruments and glasses of beer. At midnight last night, I was sitting on the floor, leaning back against the knees of Artist Friend and sharing a glass of ice water with Lilting Voice, while several friends played their guitars, Long Ponytail jammed on his harmonica, and all around me, voices joined in the singing. A lovely end to a wonderful day. Docks don’t last forever in the north country: the ice in the winter and the flooding in the spring take their toll. The dock that my father built years ago at our family camp had begun to buckle and bow, the boards beginning to rot. It was time to be replaced. Of course, in my family, any project quickly becomes a challenge. Blond Brother-in-law and I decided that we — that is, the younger generations — should try to rebuild the dock without my parents knowing. That meant we would need to time our efforts carefully, and build the whole thing in a single day. The secret dock project involved scores of secret emails and text messages, a truckful of lumber, and at least ten family members. But we pulled it off. 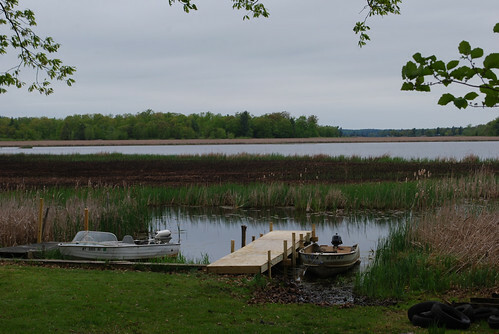 Last Saturday, when my parents left camp, they didn’t realized that they were saying goodbye to the dock that had stood in the cattails for many years. 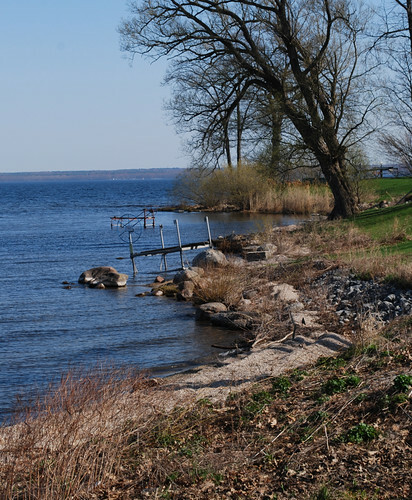 But back in Blond Brother-in-law’s backyard, the new dock had already begun to take shape. He’d assembled the dock sections, bought the new posts, and filled his truck with all the necessary tools. In the cool of the evening, we gathered in his driveway to lift the dock sections onto a trailer. The next morning, we drove the hundred miles to camp. By mid-morning, the work crew had assembled at the old dock. Blond Brother-in-law unloaded his tools and explained what we needed to do. 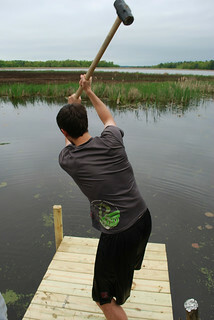 Boy-in-Black took charge of the sledge hammer and began pounding in the new posts. Blonde Niece began removing old posts and piling them in the wood pile. Smiley Girl, it turns out, is good with a claw hammer: we began tossing her any old piece of wood that needed nails removed. Shaggy Hair Boy, my husband, and I helped wherever we were needed. By the end of the afternoon, we were all wet and muddy. Shaggy Hair Boy had exhausted his supply of That’s What She Said jokes. But we’d done the job. The new dock stood in the marsh, about thirty feet long and gleaming the way new wood does. When my parents drove up to camp on yesterday, they weren’t suspecting a thing. But I got a phone call within minutes of their arrival. They were pleased and surprised and completely baffled as to how we built it so fast. When I get to camp this morning, I’ll show them all the photos I’ve got on my laptop: documentation of a job well done. Over a hundred singers performed at the last high school choir concert of the year, but the spotlight was especially on the eighteen graduating seniors. My youngest son, With-a-Why, sung for the last time with his classmates and much-loved choir director. As a musical interlude between sets, the director asked With-a-Why to show off his talents as a pianist, playing Chopin's Fantasie Impromptu. I snapped this photo beforehand, when he was warming up. No matter what the lighting, his hands always come out blurry because they are just moving so fast. I could not be prouder of this kid. 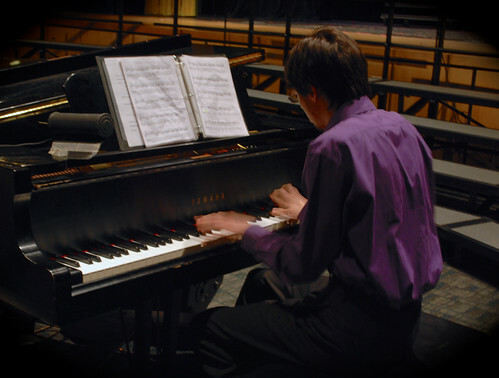 Of course, as I sat in the dark auditorium, listening to the way he's able to express himself with the piano keys, I realized that he's really not a kid any more. I've submitted all my grades, attended my last mandatory meeting, and written my annual report. This evening, I picked up the new (well, new to me — it's a few years old) two-person kayak. With-a-Why and I will test it out this weekend up at camp. Let the summer begin! The movie theater was filled with young men mostly. In fact, I think I was probably the only woman over the age of thirty. That’s what happens whenever I go to a superhero movie. “Eh, what do you care? You don’t really come for the movie,” said Jedi Knight. He’s a former student who once stayed at our house for a few weeks so that he could stay in Snowstorm Region and finish up an EMT course. That was more than ten years ago, but he still comes with us whenever my husband gathers the kids to see a movie. He was right, of course. I don’t really attend these events for the movie. I come early with my husband to save seats, and I spend the time catching up with extras I haven’t seen in a while. Jedi Knight, for example, spent his winter down south, attending grad school and has just returned for the summer. “We need ten more seats,” my husband said, counting. Jedi Knight and I tossed sweatshirts onto a bunch of seats to save them, and then sat down to chat while my husband went out to buy popcorn and lemonade, which is the other reason I come to the movies. By the time I’d heard about Jedi Knight’s semester and gotten the scoop on his girlfriend, the rest of the kids had arrived. Beautiful Smart Daughter and Sailor Boy grabbed the seats right behind us. With-a-Why carried a pad of paper covered with math formulas, and he was explaining calculus problems to his girlfriend Shy Smile as they sat down. Yeah, he’s a fun date. Blue-eyed Ultimate Player sat down next to me. “I got into all the grad schools I applied to,” he told me. He’ll be heading back to his home state soon, but he promised to visit over the summer. The tradition of going out to the movies began when the kids were small, and I needed a quiet house for grading papers. My husband would gather up our kids — and any extras — and take them to the movie theater. That would give me at least a couple of hours of quiet on a Saturday afternoon. Now of course, most of the kids arrive in their own vehicles, summoned by a text message from my husband. And my role has changed. I’m now eager to spend time with the kids, rather than eager for a couple hours away from them. The movie was the same movie we always see: some superhero has some kind of personal crisis, we get a glimpse of his past, an evil villain threats the planet or the Starfleet or whatever, the plot twists lead to battles that involve some macho hand-to-hand combat (always puzzling, given the crazy futuristic technology available), and then the movie ends with a touching moment that involves some kind of sacrifice on the part of our hero, who mutters clichés as dramatic music alerts us to the fact that this is indeed a profound moment. Eh, whatever. It’s all good. Afterwards, we stood outside in the hallway, some of us talking about the movie and others of us mocking it. Most of us are still on the academic calendar, which means we were all feeling relaxed and happy. Then eventually, we made it to the door and out into the parking lot, everyone heading home. Get a kayak. Build a website. Buy a dress. That’s what my to-do list looked like this week. This morning, I spend a couple of hours lounging comfortably in sweatpants and a t-shirt, settled in a reclining chair with my laptop open, working on a website. I had fun fooling around with the drag-and-drop website builder that a friend had recommended. Building a website turned out to be way easier than I thought it would be. I love it when I have the leisure time to learn new stuff. Then I went shopping. I usually avoid buying clothes whenever possible, but I’ve got a bunch of weddings to go to this summer. Some of the out-of-town weddings involve more than just a reception — I’m invited to dinners and brunches and events where I suspect my cut-off jean shorts leftover from the 70s might look a little out of place. I have one nice dress that I wear to weddings — if you’re friends with me on facebook, you’ve probably seen it — but when I looked at my calendar, it became clear to me that my faithful blue dress might not stretch to match every occasion. Shopping with Beautiful Piano Teacher is fun because she does all the work. She goes through the racks at the discount clothing place, yanks out anything she thinks will look good on me, and then tells me to try everything on. In the dressing room, she talks about whether or not the clothes are in fashion, while I do calisthenics to test them for comfort. We ended up finding two dresses — one that’s casual and one that’s more dressy — and I bought them both. In less than an hour, I managed to triple my summer dress wardrobe. By then I was getting the zombie feeling I was always get when I’m in a clothing store, so we went out to lunch. After that I stopped at my parents’ house to show them the two dresses. We had tea while we talked about the most exciting of the upcoming weddings: Urban Sophisticate Sister and Tall Architect are getting married in Big City Like No Other. They are only inviting immediate family, but that’s twenty-six people on our side, all congregating in the city for the celebration. It’s going to be fun. My youngest son With-a-Why and I have decided that we are going to arrive to the wedding by kayak. It will take us over a week of paddling to get there, but we figure it will make us the coolest guests at the wedding. So that led to chore number three: I went to several stores to look at two-person kayaks. 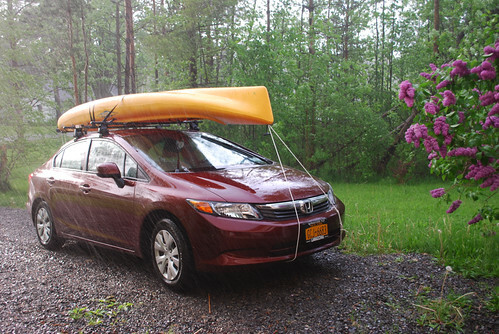 I’ve already got five canoes and a single kayak, and I want to add to the fleet. As much as I hate shopping for clothes, I love hanging out in boat stores, looking at kayaks and sailboats and canoes, discussing the possibilities with the salespeople. That was my day. I love summertime. The lilacs are blooming, just as they have every May for as I can remember. When I was small, my brother and I used to play trucks in the loose dirt under the lilac bushes at my parents’ house. When I was in labor with my son Boy-in-Black, my husband and I walked through neighborhood on a May evening, our toddler daughter between us, and the heavy scent of lilacs coming to us through the dark. “Lilacs don’t last very long,” a friend once complained when I said how much I loved them. It’s true. The fragrant purple flowers bloom quickly here, bursting forth on the first warm day, but all it takes is one hard rainstorm or one day of unseasonable heat – and the flowers are gone again. They are here for such a short time that I never get sick of the heady scent, or the amazing color. 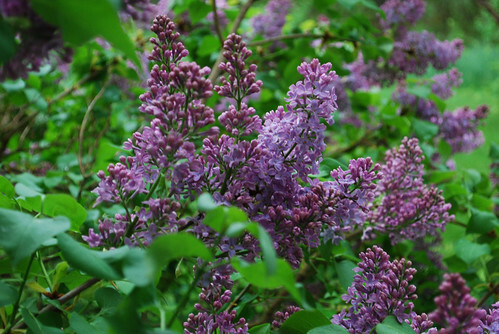 Lilacs bloom during the season of transition. Last weekend, Shaggy Hair Boy graduated from college. This summer, he’ll start a program that will give him experience teaching high school math and eventually, a graduate degree. Skater Boy, the extra we’ve known since he was little, graduated as well. He’s got a job developing software for an engineering firm. Yeah, I know. That all sounds so very grown up. Boy-in-Black turned 25 last weekend. He's a physicist. Beautiful Smart Wonderful Daughter works in the clinic as a therapist while she's getting her PhD. First Extra, whom we've known since second grade, works as an accountant. With-a-Why graduates from high school next month. He is playing Chopin on the piano as I write this. They all just keep getting older. When I gather a bunch of lilacs and put them in a vase, I stop to smell the flowers, to breathe in the scent, to appreciate the flowers while they last. I've submitted my grades, attended a bunch of end-of-the-semester meetings, and written my annual report. Another school year done. 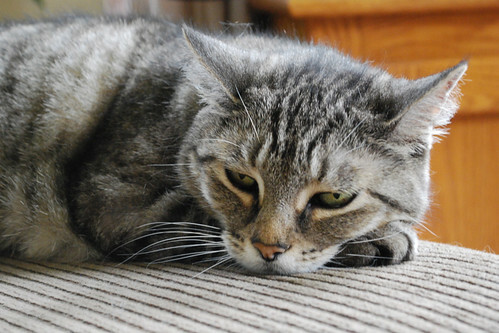 I've got all kinds of plans for the summer — a whole list of projects — but first, I want to sleep for a week. When I was a sophomore in high school, Outdoor Girl and I sneaked into the auditorium one day after school and stumbled upon a group of teenagers dancing on the stage. We hunched down in the dark auditorium, feeling quite invisible, and the teenagers up on the stage ignored us. Entranced, we watched the whole practice session. I wondered what had led these teenagers to spend their afternoon dancing but Outdoor Girl had the answer. “The Senior Variety Show,” she whispered. “They’re practicing.” This was 1977, and variety shows were as popular then as reality television shows are now. The tradition continues, at least in our local high school if not on the television screen. Last weekend, With-a-Why’s class put on their senior variety show. We all went, of course. I felt a little twinge of sadness as I sat down in the familiar auditorium, where I’ve been to so many events. With-a-Why is the youngest of the local grandchildren, the last to graduate from the school that we’ve been involved with for so many years. The first act of the show was a corny bit that ended with all the seniors, most of them wearing superhero capes, rushing in through the back door of the auditorium and running up the aisles, yelling and screaming. That kind of opening is a tradition. The show was mostly individual acts that showcased the talents of the graduating seniors, interspersed with skits that involved jokes about teachers, boys dressed in girls’ clothing, and inside jokes about the school and pop culture. Not much has changed since the 1970s. So we've been told and some chose to belive it. The whole auditorium was still, listening to his voice. No, he wasn’t doing the Kermit the Frog version: he was performing a jazzy version, an imitation of Peter Cincotti. The senior variety show traditionally ends with a slideshow. The seniors in the show, dressed now in matching hoodies, all walk out and sit down on the stage, and everyone watched the images flash across the screen, with everyone exclaiming over cute pictures of the kids when they were in elementary school. This year, when the slide show ended, they didn’t raise the house lights. Inside the spotlight shone again on the piano, where With-a-Why was seated. The kids on the stage, their legs hanging over the edge, their arms around each other, turned to watch him, and he played Claude Debussy’s Clare De Lune while his classmates listened. The highway would have been faster, but I chose the road that goes around the eastern side of the lake. I passed a little restaurant with a sign that bragged: “We have bullheads.” Local folks like my father love these fish, for reasons that no one really understands. The ice cream store, where I stopped many times as a kid with my father on our way home from sailing, wasn’t yet open for the season. At the marina, the docks were still empty except for a single boat of fishermen who were joking and swearing at each other as they worked to fix their motor. Farther on, I passed the little town with the amusement park. The rides stood empty in the spring sun. The brown sign that advertised the beach looked like it needed a new coat of paint. Most of the summer camps were still boarded up, and the first dandelions of the season were springing forth on the little lawns. After about 45 minutes of driving along the lake, I came to the little town where Biker Boy now lives. Longtime readers will remember that Biker Boy is the kid who used to live on my street and has been in foster care for more than a year. He’s living with a family now — a young couple who live near the lake. We spent the morning down by the shore — skipping stones, finding pretty ones, and investigating a dead fish that had been tossed onto a lawn. I had a chance to meet the members of the household, including the dogs and the cat and some hens. I heard about extended family members who live near by, and Biker Boy showed me his prize possession: a remote control car that actually flew through the air when he drove it off a pile of rocks. The little town hasn’t changed much since I was a kid. It’s the kind of place where Biker Boy can spend sunny afternoons riding around on his bike and swimming in the lake. I bet everyone in the town will know him by the end of the summer. I don’t want to say too much more — since this blog is no longer very pseudonymous — but right now, everything looks really good for him. He’s in a safe place with kind, compassionate people who love him and who plan to adopt him. As I drove home, I couldn’t help but feel grateful for all the people who have been working to give this kid a happy ending. So many of my students produced cool videos this semester that I thought it was time to teach myself to use iMovie. Since my readers are always asking for pictures of baby sheep from the monastery I visit, I decided to make a little video about spring at the monastery, using photographs I've taken. I didn't want to use music that had a copyright on it, so I searched my iTunes folder and came up with a song that my father recorded. It features With-a-Why singing, accompanied by my father on tenor sax and Shaggy Hair Boy on the keyboard. 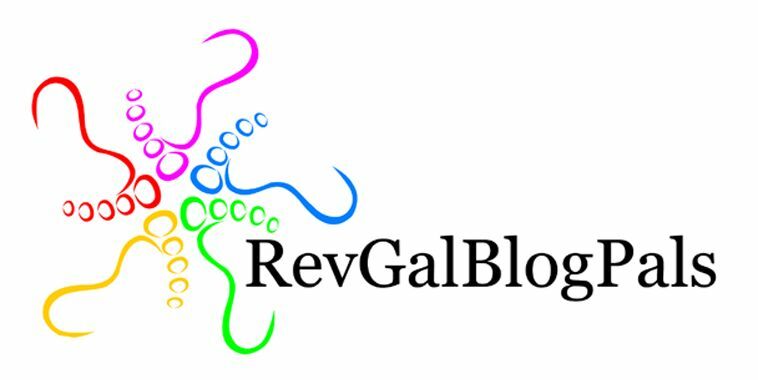 So here you go — my attempt to make this blog a multi-media event!